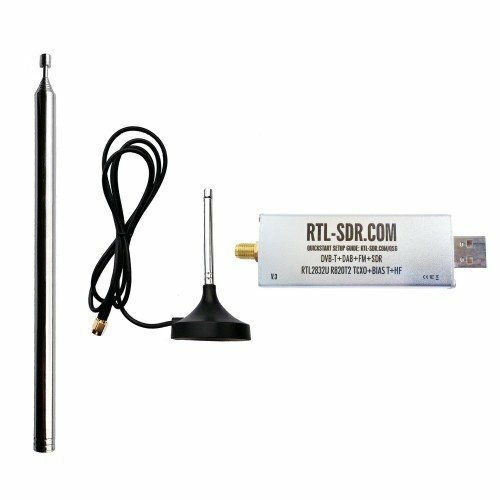 The RTL-SDR Blog V3 is back in stock in Amazon USA (Dongle + Antenna) (Dongle Only). International buyers can continue to purchase units from our store at www.rtl-sdr.com/store. Apologies for the long out of stock period, we sold out of our remaining Amazon US stock almost immediately a few weeks ago due to a large Reddit thread which popularized the Reddit /r/rtlsdr forums (a big welcome to any new RTL-SDR users!). Amazon is currently processing the new stock and it should be ready to ship out in a few days. The telescopic antennas mount onto the antenna base via a screw, so they can easily be removed and interchanged between the large and small ones, or packed away for storage. The dipole antenna base attaches to the suction cup or bendy tripod mounts using a 1/4″ camera screw. So any cheap camera mounting accessories like clamps, tripods etc can be used to mount the dipole as well. The coax cable on the base also has a ferrite core choke on it to help decouple the feedline from the antenna, and there is a 100kOhm bleed resistor added to reduce static discharge. The included suction cup mount allows you to mount the dipole on a window (ideally outside) and orient it into a vertical, horizontal or V-Dipole position. The bendy tripod allows you to use the antenna on your desk, folded over a door, on a tree branch, pole, or anywhere that the tripod legs can be wrapped around. The biggest problem that new RTL-SDR users face is the antenna. Most are starting off with a mag mount whip, and have no way to mount them outside where they should be for better reception. Keeping them inside can cause poor reception and increased pickup of local interference from electronics. Our dipole with the mounts aims to solve this problem. Using a dipole generally results in better reception than with a mag mount whip, and also allows for easier outdoor mounting. The 3M coax extension cable allows you to get the antenna at least to a window in your room. Note that although we recommend using the antenna outside, please remember to take the antenna back inside when not in use to avoid lightning/ESD/weathering problems. 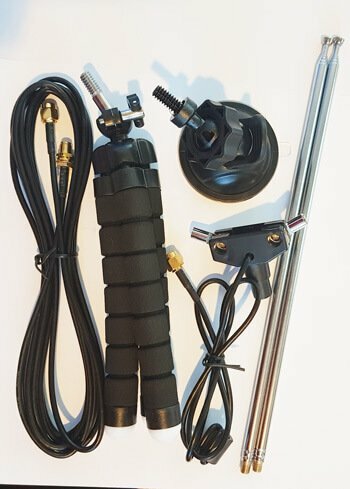 It is not designed for permanent outdoor mounting and please remember that any permanently mounted outdoor antenna should have good grounding to protect your radio against ESD and lightning. For general use we recommend using the dipole in the vertical orientation as most signals are vertically polarized. The dipole can also be used in a V-Dipole configuration for excellent VHF satellite reception, such as for NOAA/Meteor weather satellites. Just extend the telescopic dipoles to be as close as possible to resonant at the frequency of interest using this calculator. Getting the length perfect is not critical, and actually using any length will still receive something. Apart from NOAA we’ve also tested the dipole with L-band satellites. Together with an LNA and the smaller telescopic antennas it’s possible to receive Iridium and Inmarsat signals. Reception is not as good as a patch antenna, but you can still get the stronger AERO and Iridium signals quite easily. If you add a reflector made out of a small cookie tin the signals can be boosted further, and this is enough to receive the weaker STD-C and Outernet signals. Eventually this dipole set will replace the mag mount antenna bundled with the dongles currently. Target price is between $9.95 – $14.95 for the antenna set by itself, and $25.95 for the dongle + antenna set. We expect the antenna set to be ready for shipping in 2-3 weeks, and about 3-4 weeks for the dongle + antenna set. More details and usage examples will be shown nearer to the release. The R828D, the old R820T and R820T2 are all not being produced any more. The R828D2 have the same benefits like R820T2. The R8282D is essentially exactly the same as the R820T2 on the inside, just with extra features for DVB-T2 decoding. It’s also more expensive. The R820T2 hasn’t been regularly produced for some time, but it is still produced on bulk request. Also please there’s no need to spam multiple posts with the same comment. The R828D2 would allow larger (more then about 2Mhz wide) receive range then the R820T2. A technical reason why this have to be like that is the size of the DVB-T2 signal. Its also larger then 2Mhz (i think about 7Mhz wide). It would be nice to see what is then the max possible SDR-Range that can be captured. The bandwidth limitation is not related to the tuner really. The RT2832U is the limit here as this can only do 3.2 MSPS (2.4 MSPS stable) max. The R820T2 can actually receive up to 10 MHz as can be seen in the Airspy. But not with the RTL2832u. Already have a V3 dongle, but I’ll definitely be getting this little kit when it’s released! That RG174 cable is 50 or 75 ohms? 50 Ohms & V3 is matched to 50 Ohms. The effect if a 75/50 Ohm impedance mismatch is completely negligible for RX anyway. I’m looking forward to the release of the new antenna set! For now I’ve been adventurous with trying all the cool stuff with the regular 1,5m antenna but like said; it’s not enough to receive the satellite signals proper. Where can i buy this dipole antenna ? Hi, sorry the set isn’t ready yet, we’ll announce it when it’s ready for purchase. If for any reason you guys need to cut cost, the tripod or window mount seems like the obvious place (since we can get tripods elsewhere). But in any event this looks very useful! I find that analog TV antennas are more expensive these days than you’d think (every single television set used to ship with a free one, and back in the 1990s they were maybe $5 at Radio Shack). A lot of original manufacturers seem to have stopped making them right around the time they’ve gotten popular again. The suction cup and tripod mount are actually quite cheap in bulk, but if sold separately the per item costs etc would push the price up quite a bit. E.g. see Amazon, a similar bendy tripod or suction cup just by itself already costs about $8 each. Damn I just bought the current dongle+2 antenna set, I would have preferred to pay one more dollar and get the new antennas xD But it’s good news anyway. Can’t wait until I receive my dongle!